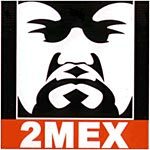 The self titled album from 2Mex. Believe me this album drops some heat!!!!! Production: 1, 3, 4, 7, 10, 11 by Omid, 2, 5, 6, 8, 9 by Liferexall, 12 by Subtitle & Omid. All scratches by DJ Mark Luv.